San Francisco, CA 2012: ORACLE TEAM USA SPITHILL, in last place position at the start of the final match race, took the overall points to win the the America’s Cup World Series San Francisco Championship. 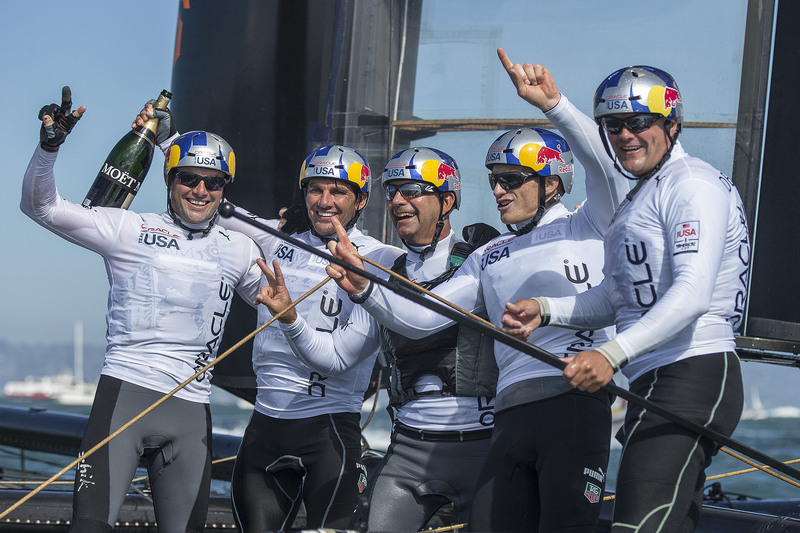 Jimmy Spithill and his crew of Dirk de Ridder, John Kostecki, Jono MacBeth and Joe Newton fought their way back through the fleet in the “Super Sunday” fleet race after starting dead last, and just barely beating stable-mates ORACLE TEAM USA COUTTS. 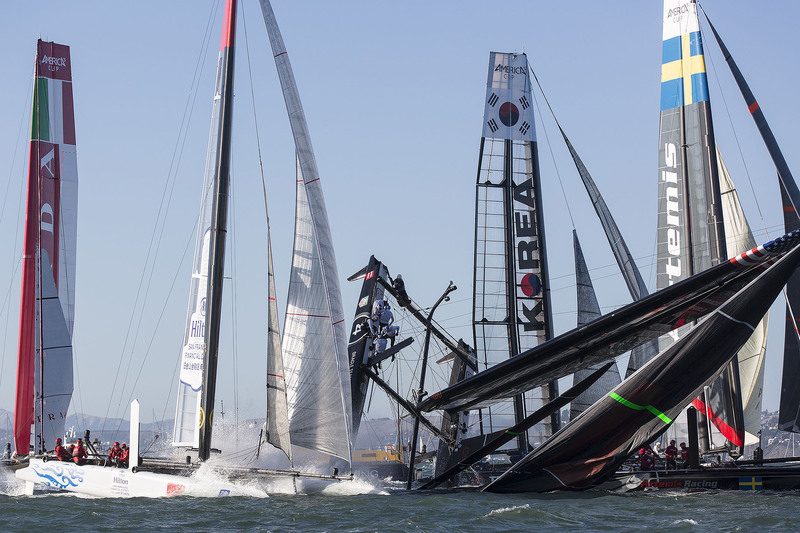 Coming from a near disaster on Saturday when ORACLE TEAM USA SPITHILL capsized their AV45 Catamaran during the first fleet race of the day, the crew made a heroic comeback to race in the very next heat. The Team also won the August AC World Series San Francisco Championship by one point, previously the closest finish at an AC World Series event. Russell Coutts said the one-two showing by Spithill and Ainslie is a good sign for Oracle’s prospects of defending the America’s Cup next year. Ainslie will be helming the No. 2 boat for in-house competition to keep Spithill’s crew sharp. 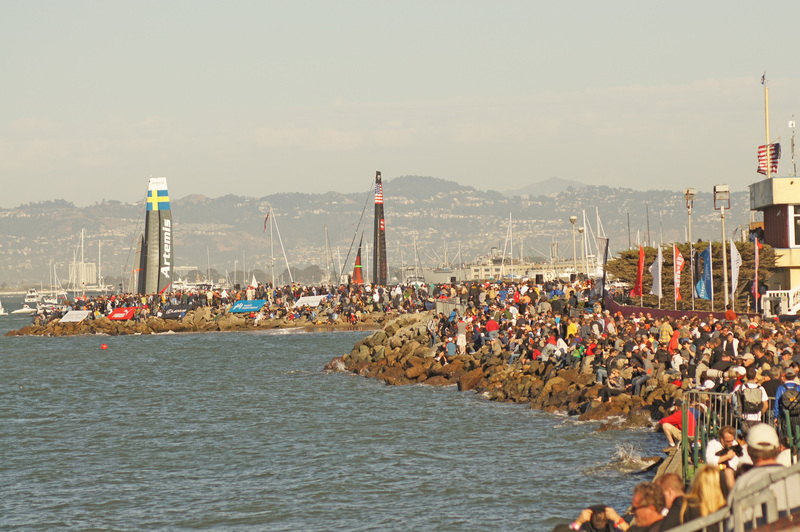 The ACWS was created to whet the appetite for the more prestigious America’s Cup event coming here next summer – 2013. 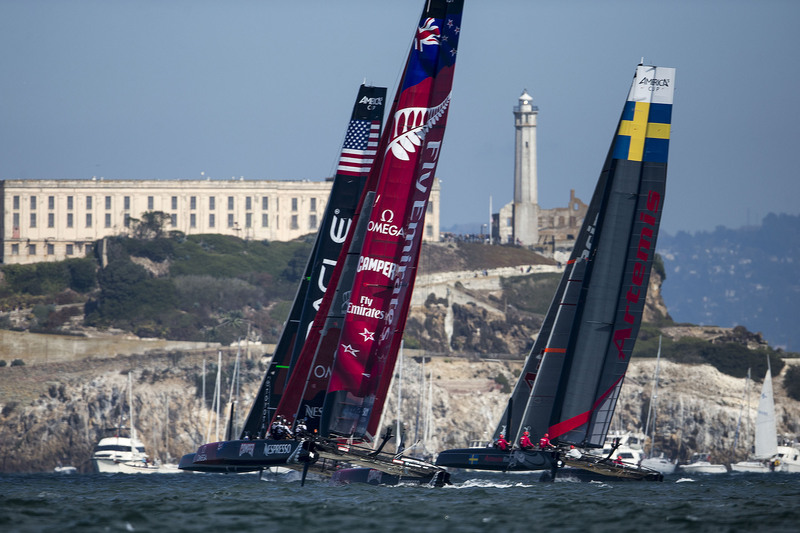 As the current holder of the Cup, Oracle CEO Larry Ellison chose San Francisco Bay as the site and the two weeks of competition this summer became part of the build-up. Why the two separate racing sessions? The U.S. Coast Guard estimated more than 150,000 spectators on shoreline along America’s Cup Village and more than 1,000 vessels watching on the Bay on just Sunday alone for the final match and Blue Angel Fleet Week air show. San Francisco City Tourism estimated that 1 million visitors were in town for “event-ageddon” to take part in the jam-packed merrymaking for various fairs, sports events and to watch the Fleet Week Airshow. Learn to Sail with OSS and Win a Free Bareboat Charter! Win a Free Bareboat Charter Cruise in the Caribbean from Offshore Sailing School (OSS)! Just take an Offshore Sailing School CRUISING COURSE Between June 1 and December 31, 2011. Then you’ll be eligible to enter the OSS contest to WIN a free bareboat charter in the British Virgin Islands on a Moorings 41.3 cruising boat in 2012. Let learning to cruise inspire you. Be creative. And you could win a fabulous cruise in the beautiful British Virgin Islands next year. Complete any Fast Track to Cruising® course, Bareboat Cruising Preparation or Live Aboard Cruising course, between June 1, 2011 and December 31, 2011, and you are automatically invited to enter this wonderful contest. Upon graduation, just document your experience in a short story about your learn to cruise experience, with photo(s) or a video…It can be as short or as long as you wish, but needs to reflect your learn to cruise experience. Cruising World magazine will choose the winner and the prize will be announced on January 30, 2012, awarding the lucky winner a fantastic bareboat cruising holiday in the British Virgin Islands in 2012. For all the details, go to www.offshoresailing.com. Get Away to a FLORIDA RESORT HAVEN at a SWEET 20% DISCOUNT! If you’re a Florida resident and want to stay “close to home” but feel like you’re in another world, a summer learning experience at one of our three Florida campuses is just what you need. And the best part is you can save 20% off your course tuition while taking advantage of our low off-season packages. Most courses are offered in half-day sessions, with time to enjoy and explore the resort you choose and its surroundings. Visit OSS for more info.